In my last post I discussed an example of how Democracy in Chains author and Duke University historian Nancy MacLean conflated a pair of historical documents written two months apart from each other to levy unfounded segregationist insinuations against economist James M. Buchanan. Despite the relative abundance of footnotes in Democracy in Chains, MacLean’s work is marred by dozens of similar examples where she confuses, misquotes, or even misrepresents the contents of the documents she cites. Several of MacLean’s academic defenders including economist Brad DeLong and historian John Jackson have credulously repeated this specific passage as “proof” that Buchanan exhibited an intellectual blind spot toward segregation, or possibly worse. There’s a problem with this claim though. The “rights of the individual” passage is yet another example of MacLean’s habit of misquoting and misrepresenting primary source documents. The passage derives from a December 1956 document in which Buchanan laid out the blueprint for the Thomas Jefferson Center for Political Economy, a free market research center he set up at the University of Virginia. The image below shows MacLean’s quotation of this document, followed by an image from the document itself for comparison. Contrast that with the actual document. 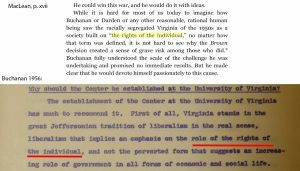 Buchanan was actually referring to the University of Virginia rather than the state or, more specifically, state politics. 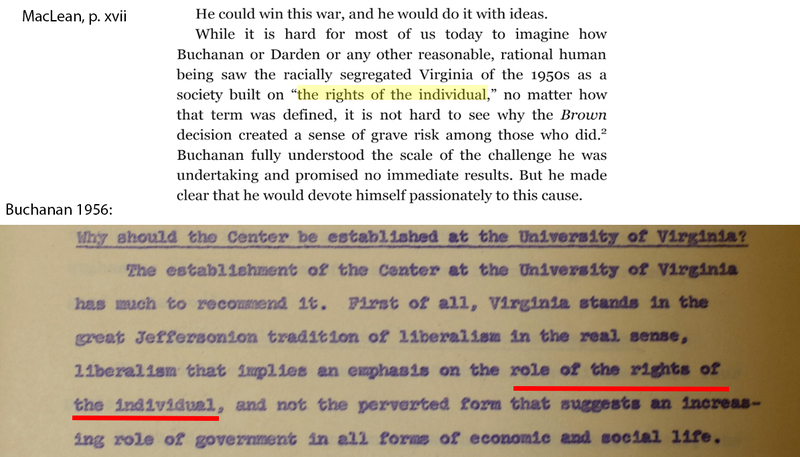 Buchanan’s reference to “the rights of the individual” was a narrow and specific appeal to Jeffersonian political philosophy, which has a distinctive and well known historical connection to the University of Virginia. It bears no resemblance to the context in Democracy in Chains. Instead, MacLean simply makes that up out of thin air and supplies it around a heavily excerpted quote. This is why readers should not take any claim in MacLean’s book at face value. Misrepresented primary source documents are a pervasive fault of the book, and MacLean’s defenders such as DeLong and Jackson have rushed to the defense of some of her strongest claims without bothering to investigate the accompanying documents. Jackson in particular has asserted that “None of Maclean’s critics have even come close to showing why she’s wrong about this” specific passage. On the contrary. MacLean is wrong about this passage, and dozens others like it, because she blatantly misrepresents the contents of the document where it originated. 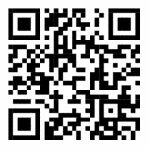 This entry was posted by Phillip W. Magness on Saturday, June 9th, 2018 at 11:31 pm	and is filed under Uncategorized. You can follow any responses to this entry through the RSS 2.0 feed. Both comments and pings are currently closed.